An independent, friendly group of recorder players led by tutor Rosie Land, an experienced tutor and First Class Honours graduate in music from the Royal Music Academy. The Consort play at intermediate level. Mostly renaissance, baroque and occasional jazz. If you are interested in joining, please contact the Secretary Helen Penn on Helenhjps@yahoo.co.uk or the centre on 020 7708 4556. The Camberwell Players played delightful, entrancing music at the annual Christmas concert by the pupils and friends of Sue Klein, Recorder Teacher. They played the following pieces – Ballet, and a suite of three dances – Gaillarde au joly boys, Passomezzo d’Italye and Gaillarde d’Ecosse. All wonderfully transporting – a real tonic on a Friday night after a hectic week! The concert held Friday December 10th 2016, at Christ Church on Barry Road in East Dulwich, marked the culmination of months of hard work by the Camberwell Players and dedicated teaching by their teacher, Sue Klein. 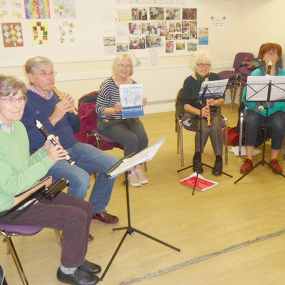 As a Recorder Ensemble, they have been meeting for three years now at the Southwark Pensioners Centre in Camberwell every Thursday from 11am-12pm. The Camberwell Players are recruiting new, fairly experienced members (Grade 1-3 standard). Without new members, the group is at risk of not being able to continue at the centre. Please do get in touch if you are interested.